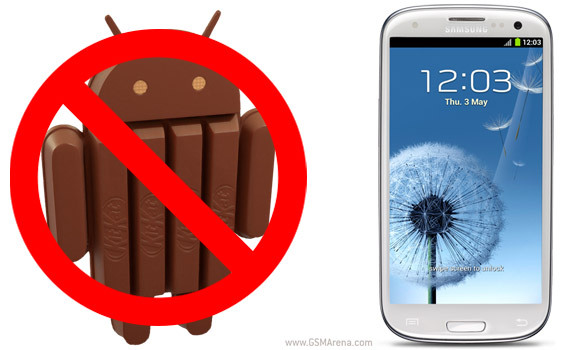 Samsung's US team released a list of devices that are getting the Android 4.4 KitKat update, putting their users' minds at ease. What about the international versions of the phones though? A blogger in Poland got in touch with a local Samsung representative and found out. The Samsung Galaxy S III is conspicuously missing from the list, even though its phablet counterpart – the Note II – is on it. Reportedly, the reason is the amount of RAM, the Galaxy S III has "only" 1GB. That can't be the real reason though – the Galaxy Grand has 1GB RAM too. Plus, KitKat is optimized for 512MB devices, it's more memory efficient than Jelly Bean so even the weight of TouchWiz can't be it (and again, the Grand has the same amount of RAM). Note that the US version of the Galaxy S III will be getting KitKat, though that one has 2GB of RAM. Whatever the reason, this puts Samsung's 2012 flagship in the same boat as the international HTC One X (though HTC blamed NVIDIA's chipsets) - remaining on Jelly Bean or go the unofficial ROM way.